The Jungar Khanate coloured green. From the 1732 map of "Imperium Russiae Magnae"
prepared for the Empress Anna Ionnovna by Matthaeus Seutter, Augsburg. In the 17th century Jungars, or Mongol Oirat tribes from East Turkestan, began moving west and started attacking the eastern Qazaqs. The Great Horde had been able to halt their invasion around Lake Balkash. However in the 1710s the Jungars resumed their western movement with greater vigour, at a time when the Qazaq Hordes were in conflict with each other. Aware of the impending danger, both the Qazaqs and the Karakalpaks attempted to secure closer relations with Russia but without success. 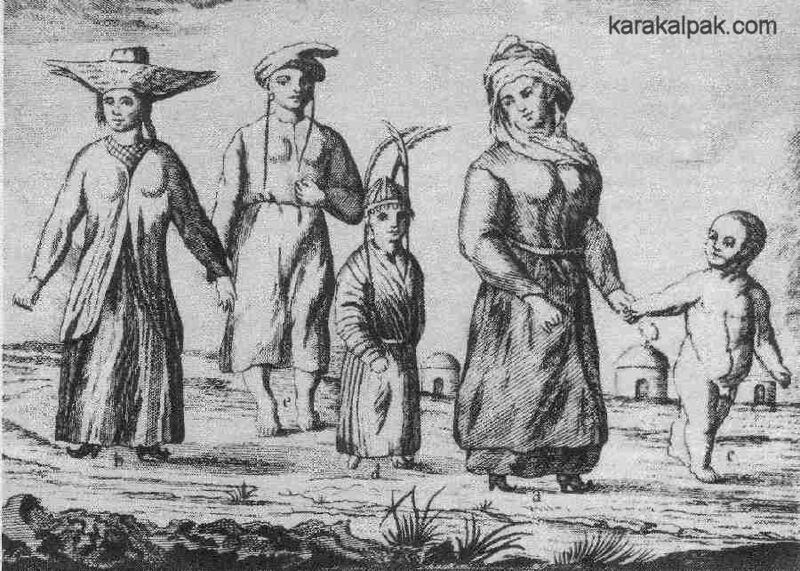 Although the Russians sent an ambassador to hold discussions with the Karakalpaks in 1721, nothing resulted from the discussions. In 1723 the Jungars invaded in force, overwhelming the Great Horde and any Karakalpaks who remained in the eastern part of the middle Syr Darya, causing destruction to the towns and villages, irrigation systems and crops. Many people were taken away in captivity. This whole episode caused the complete disruption of the Qazaq nation and has gone down in their history as "the years of the Great Disaster". Most of the tribes belonging to the Middle and Little Hordes took flight, with the Little Horde dispersing to the banks of the Emba, Ural and Volga rivers and a minority going towards Khiva. This in turn led to conflict, with the fleeing Qazaqs and Karakalpaks being attacked by Volga Kalmuks and Ural Cossacks. The Russians, fearful that the Karakalpaks might combine with the Bashkirs and other steppe tribes, supported the Kalmuks and supplied them with arms. Some Karakalpaks moved eastwards with some of the Middle Horde Qazaqs, along the Syr Darya to Tashkent, and then south-west into the Samarkand region, while many others migrated into the Ferghana Valley. Here they settled and their ancestors still live in the many fully or partially Karakalpak villages that can be found throughout these regions today. 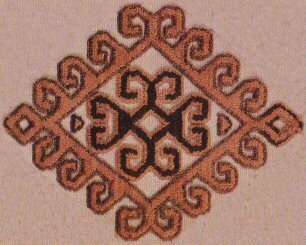 Some Karakalpaks migrated westwards and settled between the Ural and Volga Rivers in what is today modern Bashkiria. However the majority of Karakalpaks moved south-west into the lower Syr Darya, the Quwan Darya, the Jan'a Darya and south towards the Aral Sea. 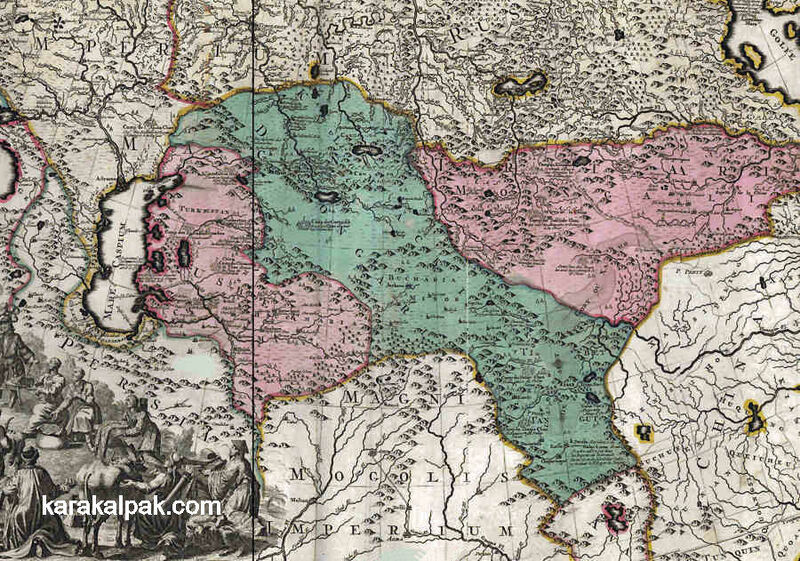 Most of the "upper" Syr Darya Karakalpaks had finally been forced together with the "lower" Karakalpaks. This traumatic episode led to renewed cooperation between Karakalpaks and Qazaqs to gain Russian protection. The Karakalpaks sent ambassadors to Russia in 1725, and the leader of the Qazaq Lesser Horde, Khan Abu'l Khayr (1717-48) who also ruled over the "lower" Karakalpaks, sent his delegation the following year. Unfortunately the Russians had gained the impression that the Karakalpaks were a warlike and aggressive tribe. However, when Abu'l Khayr sent his ambassador to Saint Petersburg in 1730 with a proposal to place the Little Horde under the patronage of Russia, the Russians responded by sending their ambassador to see Abu'l Khayr in the following year. This was a long and productive visit during which it became clear that both the Karakalpaks and the Qazaqs genuinely sought peace under the protection of Russian citizenship. The wife of Abu'l Khayr Khan of the Qazaq Lesser Horde with her children. The woman second from left is a Kalmuk prisoner. From "Materials on Russian History since the death of Peter the Great", Riga, 1784. Back in Russia I. K. Kirilov, the secretary to the Russian Senate, became a proponent of the idea, realising that naturalization would provide Russia with a way of controlling the tribes, pacifying the steppes and increasing security and trade. After a return visit to Saint Petersburg, deeds of naturalization were finally issued to Khan Abu'l Khayr and Khan Kaip, one of the Karakalpak Khans. The territories of the Middle and Lesser Hordes had effectively become an integral part of Russia. Detail from Philip Johann von Strahlenberg's "Nova descriptio geographica Tattariae magnae" published in 1730. 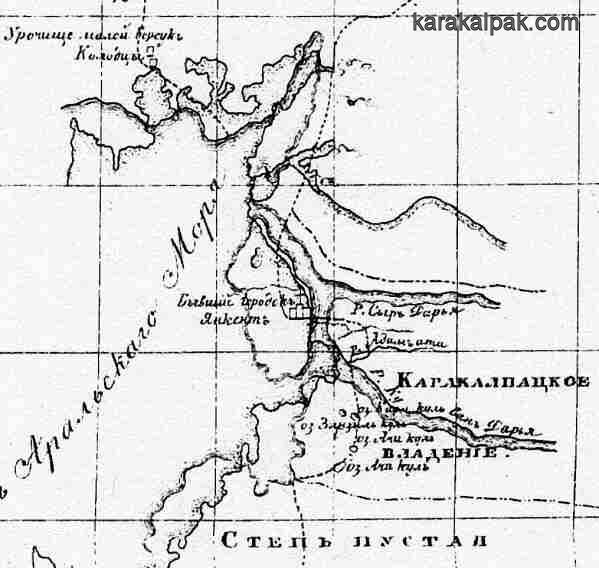 It shows Karakalpaks living in the region from the mouth of the Emba to the middle Syr Darya. From Göttingen State University Library, Germany. Published by Homann Erben in 1739. Tomsk Oblast Museum of Regional History, Tomsk, Russia. Kirilov was tasked with the founding of a new city at the mouth of the river Or, which subsequently became Orenburg, and Qazaq and Karakalpak peoples were encouraged to come and settle and to establish their trades and professions in its environs. Its purpose was to act as an important staging post for Russian commercial caravans. 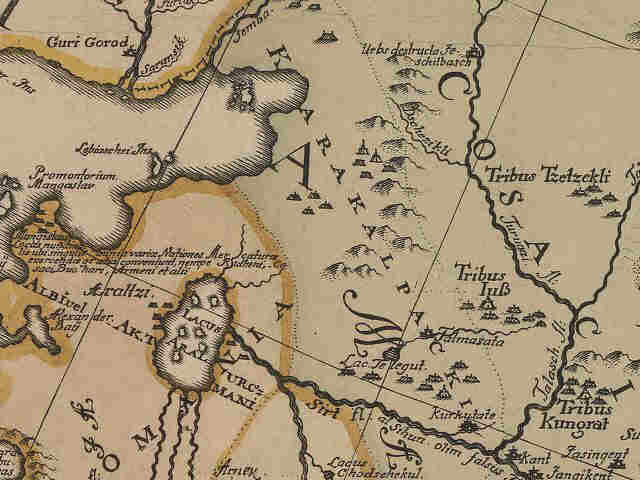 Part of Kirilov's duty was to re-map the region, and the map of the Aral region in his 1734 Atlas shows Karakalpaks in the delta of the Syr Darya and along the eastern shores of the Aral Sea and "subject Kyrgyz" [Qazaqs] to the north of the Aral Sea. Following the accession of the Empress Elizabeth Petrovna, Lieutenant Gladyshev was sent from Orenburg with his surveyor, Muravin, to visit Abu'l Khayr Khan at his headquarters on the Quwan Darya. It was felt expedient to repeat and record the oath of allegiance from all of the "lower" Karakalpak tribal leaders representing some 12,000 nomad tents. But the Karakalpaks stressed to Gladyshev that although they wanted Russian citizenship, they also wanted to escape from the yoke of the Qazaq Khan. 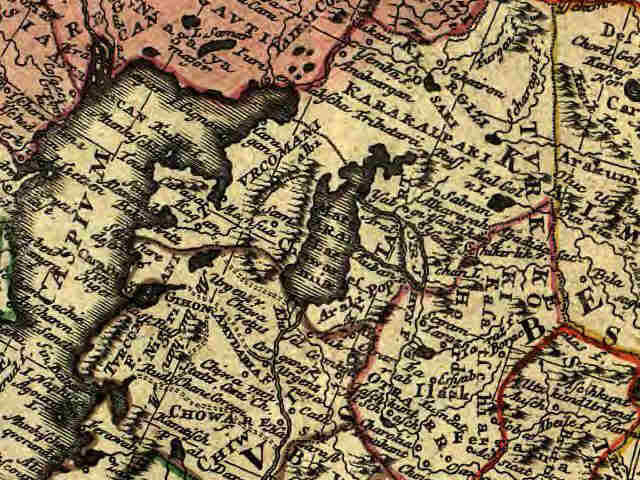 Detail of Muravin's map showing the Karakalpak Division on the Quwan Darya in 1741. Thanks to this expedition Gladyshev and Muravin provided the first documentary information about the Karakalpak people, including a summary of their tribal structure, and their semi-nomadic lifestyle, involving a mixture of stockbreeding, irrigated delta agriculture and fishing. They kept horses, sheep, goats, cattle and a few camels, using cattle to pull both the plough and their two-wheeled carts or arba. For navigating the waterways they used 6 metre-long boats with small sails, which were capable of crossing the Aral Sea from the mouth of the Syr Darya to the mouth of the Amu Darya. They farmed wheat, barley and millet and cut down the reeds for animal fodder. This page was first published on 12 October 2008. It was last updated on 3 February 2012.